According to the legend, on the day the Madurai was to be named, Lord Shiva blessed the land and its people while divine nectar showered from his dreadlocked hair. The city hence came to be known as “Madhurapuri”—the City of Divine Nectar. Perhaps the two most famous legends associated with Madurai are those of Kannagi and Meenakshi—the first a woman who ascended to the status of a goddess, the second a goddess who’s legend has become one with the history of the city’s people. Madurai is centred on its 2,500-year-old Meenakshi-Sundareswarar Temple1; the city’s streets and thoroughfares expand out from there, one after another, in a concentric fashion, as if like a lotus flower. The legend of Goddess Meenakshi begins with her father, Emperor Malayadwaja Pandyan, the successor to Madurai’s founder Kulasekhara Pandyan. For years, Malayadwaja and his consort Kanchanmala were unable to conceive any children. In attempts to beget a child, Malaydwaja conducted many Vedic homas [rituals involving a fire pit]. Finally, in the middle of one such ritual, a three-year-old girl with three breasts2 emerged from the homa flames and sat on Kanchanmala’s lap. The girl in fact was Goddess Parvati, who had taken birth as Kanchanmala’s daughter in response to a prayer of hers in her past life. In fact, Malayadwaja was a bit sad that he was not blessed with a son. But suddenly he heard a disembodied voice tell him that he should name the girl “Tatātakai” and to raise her as if she was were a son. The voice ensured Malayadwaja that Tatātakai’s third breast would be absorbed back into her body when she first cast her eyes on the man who would become her husband—Lord Shiva. Malaydwaja obeyed the divine command. He named Tatātakai his successor and taught her the art of war. After Malayadwaja’s death, Tatātakai ascended to the throne. 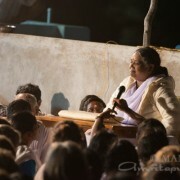 She was the beloved of the people and came to be known as “Meenakshi”—the one with fish-like eyes3. Meenakshi embarked on a dig-vijaya, a military campaign of victory across the length and breadth of India. After numerous victories on earth, Meenakshi attacked Mount Kailash, the abode of Lord Shiva. She defeated all the soldiers and generals of the Lord. Seeing this, Shiva himself came to fight the undaunted queen. But as soon as Meenakshi saw the Lord, the prophecy of her youth bore fruit: she instantly fell in love with him and her third breast went back inside her body. Shiva directed Meenakshi to return to her home city, promising her that he would join her in eight days as her bridegroom. And this is exactly what happened. 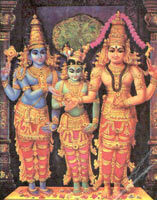 They were married in Madurai with Lord Vishnu himself giving away Meenakshi to Shiva. Meenakshi Kalyanam—the marriage of Meenakshi with Shiva—is celebrated annually to this day. According to the sthala purana—Tiruvilayadal Puranam, written by Paranjothi Munivar in the 16th century—Meenakshi and Lord Shiva ruled over the city of Madurai for a long time in the form of mortals. (Emporer Sundara Pandya being considered to be Lord Shiva. His son, Ugra Pandya, considered to be Lord Subrahmanya.) The 64 miracles of Lord Shiva that are enumerated in this later-day Tamil purana are taken from the Sanskrit Halasya Mahatmyam. In fact, the Madurai that we know today is not the Madurai of ancient times, for it is said that the entire city was once destroyed in an all-consuming fire. The story behind that fire is told in the 5,270-lined epic poem Cilappatikaram [“The Story of the Jewelled Anklets”] written by a Jain monk by the name of Ilango Atikal in the 5th century C.E. According to the author of the poem, it is a story about the importance for kings following dharma, the glory of a chaste woman and the effects of past-life karma. Although Cilappatikaram was written only 1,500 years ago; the story itself is much older. The poet-monk only learned of the story when visiting the countryside near the Periyaru River with his brother, Senkuttuvan, a Chera King. On the banks of the river, villagers told the king and Ilango the story of Kannagi, a woman with a single breast who sat down under a tree and did austerities for 15 days, without food or water, until she died. The villagers worshipped Kannagi as the Goddess of Chastity, and her story so inspired the king that he asked his brother to immortalize it in poetry for the benefit of mankind. Rather than retell the story, here are lines extracted from the translation by Professor A.L. Basham from the original Tamil. Kovalan, the son of a wealthy merchant in Kaverippattinam, married Kannagi, the lovely daughter of another merchant. For some time they lived together happily, until, at a festival at the royal court, Kovalan met the dancer Madavi and fell in love with her. He bought her favours and in his infatuation forgot Kannagi and his home. Gradually he spent all his wealth on the dancer. At last he was penniless, and returned repentantly to his uncomplaining wife. Their only fortune was a precious pair of anklets, which she gave to him willingly. With these as their capital they decided to go to the great city of Madurai, where Kovalan hoped to recoup his fortunes by trade. On their arrival at Madurai, they found shelter in a cottage, and Kovalan went to the market to sell one of Kannagi’s anklets. But the queen of Nedunjeliyan, the king of the Pandyas, had just been robbed of a similar anklet by a wicked court jeweller. At last the patron goddess of the city [Meenakshi] interceded with Kannagi, and she agreed to withdraw her curse, and the fire abated. Weak with loss of blood from her self-amputated breast, Kannagi struggled to a hill outside the city4, where after a few days she died, and was reunited with Kovalan in Heaven. Meanwhile the news of her death spread throughout the Tamil Land. 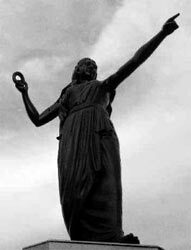 She was deified, temples were raised and festivals held in her honour, and she became the patron goddess of wifely loyalty and chastity. “Chaste women of Madurai, listen to me! Today my sorrows cannot be matched. Things which should never have happened have befallen me. saw her, and were moved by her grief and affliction. “Wrong that cannot be undone has been done to this lady! Our King’s straight sceptre is bent! the Lord of the Umbrella and Spear! in her hand a golden anklet! is as though filled with godhead! some showed her her husband’s body. done to their wedded lords? Are there women here? Are there such women? and guard them with care? Are there men here? Are there such men? has slain an innocent man? and he stroked her face with his hands. and went, surrounded by the gods. till my great wrath is appeased! she went to the gate of the palace. whose evil heart has swerved from justice! “A woman waits at the gate. Kannagi was then admitted to the King’s presence. 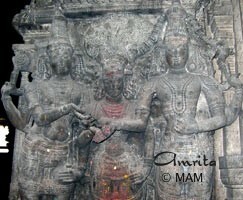 Then Kannagi showed her anklet to the king. belonging to the Queen, he realised that Kovalan had been innocent. and the sceptre trembled in his hand. who have heeded the words of the goldsmith. I have failed to protect my people. but I will destroy it as the King is destroyed! listen! Listen you gods in heaven! “Listen to me, you holy sages! With her own hand she tore the left breast from her body. calling her curse in bitter agony. as the gods who guarded the city closed their doors. stood silent and still as painted pictures. “Whence comes this woman! Whose daughter is she? 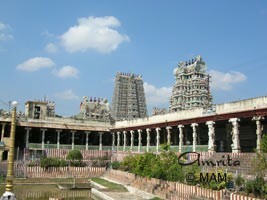 1 Amma was taken to this temple as a young girl by her father. According to Suganandan Acchan, Amma went into samadhi and the temple priest came before her and performed arati. 2 This could be symbolic in the same way as the third eye—as a symbol of spiritual wisdom, the milk of spiritual knowledge. 3 Indicates the beauty of the eyes. In Lalita Sahasranama, mantra 18 refers to Devi as “She whose eyes possess the lustre of the fish that move about in the stream of beauty flowing from her face. [vaktra lakshmi parivaga calan minabha locana.] According to Indian mythology, a fish is also supposed to hatch its eggs by staring at them intently. Thus, Devi’s glance is supposed to bring about a spiritual rebirth. 4 In fact, Amma herself has said that Kannagi did her tapas in Kodungallor, the city in Kerala, where the Ashram built its first Brahmasthanam Temple.